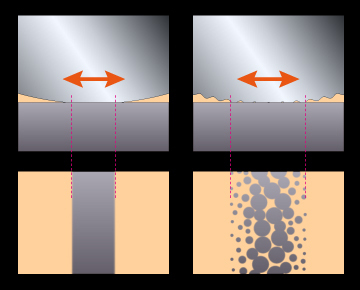 The fine grooves, that are intrinsically engraved into the product surface at the time of machining, are transformed into micro-dimple indentations by the impact of the ultra-fine media during WPC treatment. These dimples then act as oil reservoirs. Thus, oil that would normally drain away, through the grooves in an untreated product, when pressure is applied, is instead retained in the dimples of a WPC treated product. This helps to keep the surface lubricated. 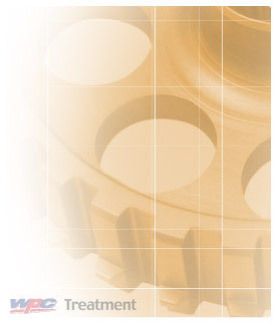 Furthermore, solid lubricants such as Tin (Sn) and Molybdenum Disulfide (MoS2) can be utilized as media in the WPC process to embed them into the product surface. This reduces friction and improves the life and efficiency of the product to an even greater level. 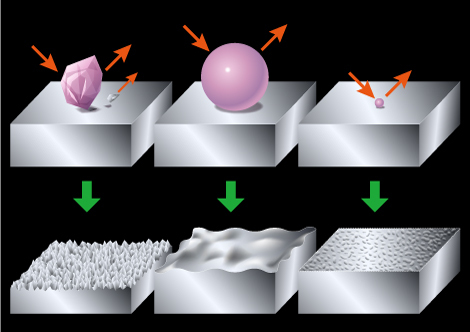 This process is called PIP(Powder Impact Plating).